Still no issues found. And no repeat of the 3D freeze. Happy. Great features. Yes, and thanks for that! There are some horror stories from large projects, where the developers had access to hardware much more powerful than the average user, and the result was a disaster. It is never a bad idea to test new releases on the slowest computer in the organisation. Quite, it is my impression that a planIcon# png with the same proportions as the model, will render more nicely and with less blur (until the proportions are changed, that is). The nice thing with home-made planIcon# pngs is that the model-maker has control over how it renders. Yes, and this surprised me. I really noticed absolutely nothing in terms of performance. So, job well done. Inkscape uses Ctrl-Shift-P for programme preferences and Ctrl-Shift-D for document properties. Both dialogues seem to be intended for frequent use and the logic appeals to me, but Ctrl-Shift-P is already used. So I dare not suggest, but + and , moves about depending on the nationality of the keyboard, which means I never learn them. java 1.8.0_51 and java3d 1.6.0 installed on my laptop. bdfd, sorry, it's the first time I'm reported this kind of problem with JNLP files. No idea of the origin, but don't worry, I'm pretty sure this won't happen with the finally released installer. Would you consider adding a shortcut for modifying the Virtual Visitor? It would be a great help when the camera symbol is out of view and not selectable for double-clicking. 1. Your's work at new features are great and work fine. I usually use the v2 for my taste. About the first improvement door and windows to don't be deformed it work as expected and is great. 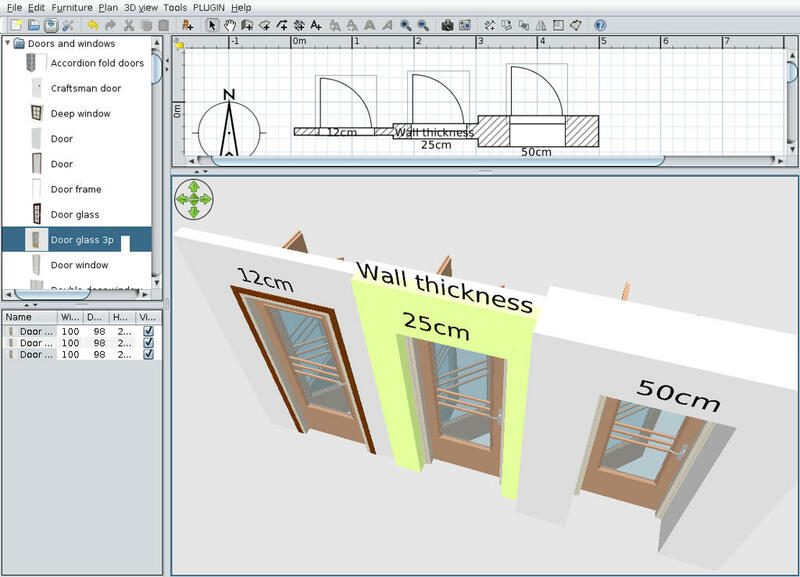 The casing are well positioned when the thickness of the wall are the same as the doorOrWindowWallThickness#1=12. I suspect I do something wrong but I don't know what. I modify also other doors and windows from contributors library and some work well but other don't. It appear the doorOrWindowWallDistance#1=1 are computed from the middle of the wall not from the side of wall. Is not necessarily a problem wile I use the arrow keys to correct the position but is a little difficult when are angled walls (different then 90dg). - To prevent selectioning and showing the virtual visitor in the plan each time a move is made in the 3D view, you can now unselect the new Virtual visitor selected at change option in the preferences panel. But don't get lost! - And after many years, I finally added the ability to rotate furniture (but not doors and windows, staircases and groups) around either their roll (Y) or pitch (X) horizontal axes. Rotation can be changed with the furniture modification dialog. 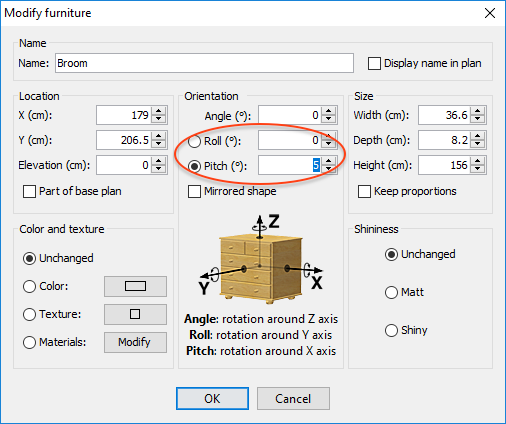 Once a piece of furniture has its roll or pitch angle set with a value different from 0, it's also possible to adjust this angle in the plan with its bottom left indicator that replaces the one used to modify the height. The height indicator was actually removed because the size indicator can resize only proportionally a piece of furniture that is horizontally rotated, or a group that contains such pieces. The center of a rotated object in the plan doesn't move after a rotation and its altitude is adapted to ensure that its lowest vertex remains at the elevation set on the object. Angle values increase clockwise the same way as for the rotation angle around the vertical axis in past versions. - I also added the horizontallyRotatable property to prevent some models to rotate around an horizontal axis if needed. I wonder on which 3D models of the free library I should set this property. Any idea? - Finally, I fixed the location and icon in the plan for 3D models with a non paralleledipep shape (like a cone), when a rotation different from 90° was applied on it at importation time. This correction won't be applied on existing objects in an opened sh3d file to prevent breaking compatibility. I sincerely hope you'll like the way I programmed the rotation around horizontal axes, and won't think it overcomplicates Sweet Home 3D. Dorin, sorry, I don't think I'll change viewable / unviewable words in the user interface, because even if it's subtle, a viewable upper level can still be invisible in the 3D view when the 3D view > Display selected level menu item is selected. It's the reason I chose two different words. About your other post, I don't see any issue about the open doors you tested. The front part of a door with a doorOrWindowWidthDepthDeformable property set to true is magnetized to the side of the wall where you drop it. In your example, the values of doorOrWindowWallThickness and doorOrWindowWallDistance properties are subtracted from the depth to know the depth of the front part where the open door is, i.e. 98 - 12 - 1 = 85 cm. Don't work on my main PC too ! When a exe release ? The final release won't appear before a few days or weeks, because it requires some translations. But as the version 5.5 is supposed to fix the bug that prevents to show file dialogs in Windows 10 Creator update, here's a Windows installer for version 5.5 Beta 4 [link removed, see this message to test version 5.5 Beta 5] to let you and others check this bug was fixed (you shouldn't need the SweetHome3D.l4j.ini file to set swing.defaultlaf anymore). I updated also the Java Web Start version to version 5.5 Beta 4 after fixing some bugs I discovered on the management of groups which contain objets rotated around an horizontal axis.